In June of 2005 Bill Donaldson was fired at Chairman of the SEC, primarily for advocating for the registration of hedge funds. Donaldson was a loyal Republican, close Bush family friend and former CEO of a major corporation. On his last day in office Donaldson voted with two Democratic nominated commissioners to require that hedge funds register with the SEC, an action that was later overruled by an appeals court. Sadly, Donaldson is one of many competent and effective government officials that have been systematically removed from the current administration. He was replaced by a California congressman who appears to not have either the background or courage to fulfill this most important role. 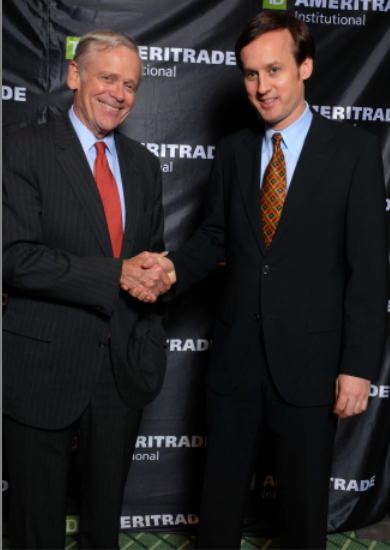 Here is a photo of Donaldson, whom I met at an institutional investment management conference in 2006. One need only look at the impact of hedge funds on the banking system to see how right Donaldson was. See 5 minute youtube video explaining how both former President Clinton and Bill Gates Jr. are exploiting this loophole.